“It’s Christmas Day!” said Scrooge to himself. “I haven’t missed it. The Spirits have done it all in one night. They can do anything they like. Of course they can. Of course they can. He wakes moments before the arrival of the Ghost of Christmas Past, a strange childlike phantom with a brightly glowing head. The spirit escorts Scrooge on a journey into the past to previous Christmases from the curmudgeon’s earlier years. Invisible to those he watches, Scrooge revisits his childhood school days, his apprenticeship with a jolly merchant named Fezziwig, and his engagement to Belle, a woman who leaves Scrooge because his lust for money eclipses his ability to love another. Scrooge, deeply moved, sheds tears of regret before the phantom returns him to his bed. The Ghost of Christmas Present, a majestic giant clad in a green fur robe, takes Scrooge through London to unveil Christmas as it will happen that year. Scrooge watches the large, bustling Cratchit family prepare a miniature feast in its meager home. He discovers Bob Cratchit’s crippled son, Tiny Tim, a courageous boy whose kindness and humility warms Scrooge’s heart. The specter then zips Scrooge to his nephew’s to witness the Christmas party. Scrooge finds the jovial gathering delightful and pleads with the spirit to stay until the very end of the festivities. As the day passes, the spirit ages, becoming noticeably older. 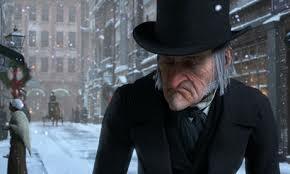 Toward the end of the day, he shows Scrooge two starved children, Ignorance and Want, living under his coat. He vanishes instantly as Scrooge notices a dark, hooded figure coming toward him. The Ghost of Christmas Yet to Come leads Scrooge through a sequence of mysterious scenes relating to an unnamed man’s recent death. Scrooge sees businessmen discussing the dead man’s riches, some vagabonds trading his personal effects for cash, and a poor couple expressing relief at the death of their unforgiving creditor. Scrooge, anxious to learn the lesson of his latest visitor, begs to know the name of the dead man. After pleading with the ghost, Scrooge finds himself in a churchyard, the spirit pointing to a grave. Scrooge looks at the headstone and is shocked to read his own name. He desperately implores the spirit to alter his fate, promising to renounce his insensitive, avaricious ways and to honor Christmas with all his heart. Whoosh! He suddenly finds himself safely tucked in his bed. Overwhelmed with joy by the chance to redeem himself and grateful that he has been returned to Christmas Day, Scrooge rushes out onto the street hoping to share his newfound Christmas spirit. He sends a giant Christmas turkey to the Cratchit house and attends Fred’s party, to the stifled surprise of the other guests. As the years go by, he holds true to his promise and honors Christmas with all his heart: he treats Tiny Tim as if he were his own child, provides lavish gifts for the poor, and treats his fellow human beings with kindness, generosity, and warmth. Next Next post: On the mystery of the incarnation.